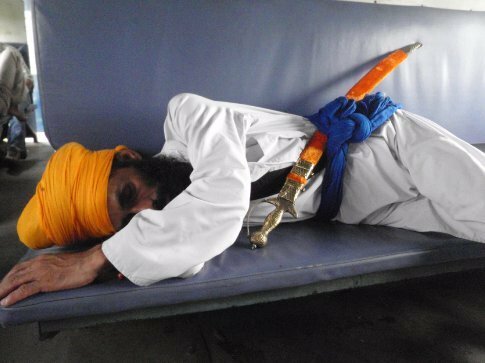 As I waited for the train to leave the platform a tall Sikh with a large sword sat opposite me and promptly lay down to sleep. I'm no expert but it didn't look like the deadliest or most ostentatious of swords although, along with his clothes and turban, seemed to be the sum extent of his worldly possessions. The remainder of the journey, to Pathankot, the closest broad guage rail head to Daramshala, was uneventful. 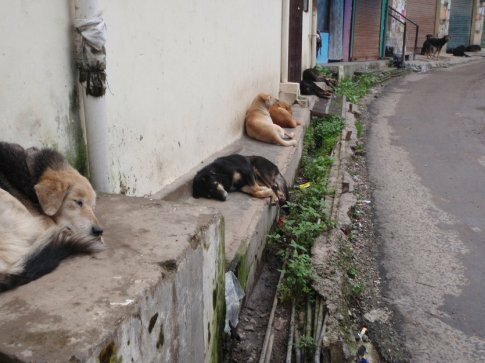 Pathankot seems to be an Air Force town – as I waited in the bus stand a myriad of jets tore up the sky above, ignored by the locals. 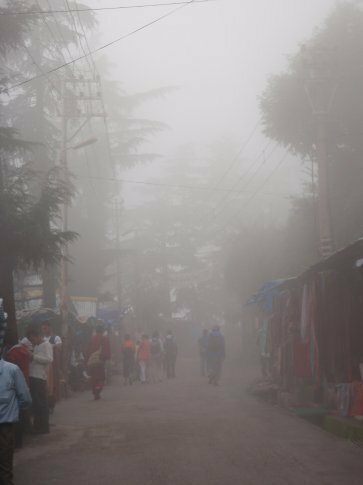 The three hour bus ride through the foothills of the Himalayas was pleasant – the difference in temperature was noticeable. 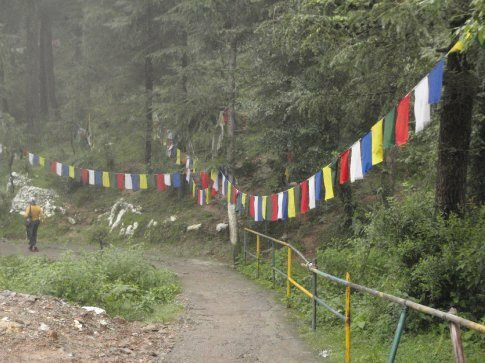 The last leg of the journey was a steep 30 minute bus ride from Daramshala to Macloed Ganj nestling 500m in the mists above it at 1768m, during which I met Eric and Julie, a friendly couple from France. Yet again I was reservationless but headed towards the Green Hotel which Footprint has recommended. I checked into a decent room, had a deliciously hot shower before heading back to the reception area. The friendly Tibetan manager introduced me to Elizabeth, a girl from Walkinstown who had been travelling in the Middle East and Austraila. She was meeting people in a bar later and asked me to join her. Well all this was pretty encouraging I had to say. There were people. There was a bar! (not that I had been craving a beer, more that it was nice to be in a place where there is an established market for socialising!) Elizabeth's friends never showed up but we had an interesting conversation while the band covered Nirvana and the Doors. Elizabeth was about to start a Masters in Conflict Studies but was taking a special interest in the gender aspects of conflict. So far Macleod Ganj had exceeded expectations – there were people, the air was clear and clean and there was a distinct atmosphere that made it feel like a different country. I hadn't even seen it during the day yet! Macleod Ganj woke up in a cloud, as it often does and I took the opportunity to catch up on the internet in the cafe. I could even use my laptop as they had wireless! People breezed in and out of the rain and chatted to strangers while having lunch. This felt more like a hostel in South America than anywhere I had seen in India. I had arranged to meet Eric and Julie for dinner so we went back to McLlo's where I had been the previous night. There was no music this time but we made our own entertainment and laughed a lot. The following day, after two nights in the town I decided it was high time I went out and explored a little. 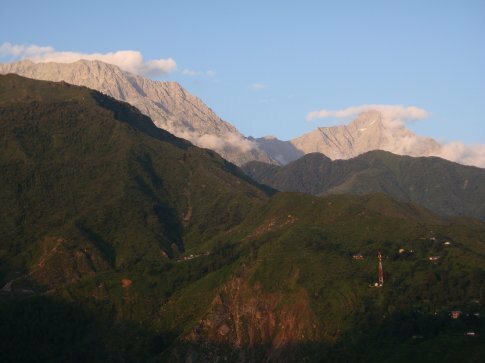 The town was established by the British in the 19th century (hence the Scottish sounding name) and remained a quiet hill station until the Chinese settlement of Tibet in 1959 during which the Tibetan spiritual leader, Tenzin Gyatso, His Holiness, the fourteenth Dalai Lama fled here and over time established the Tibetan government in exile. 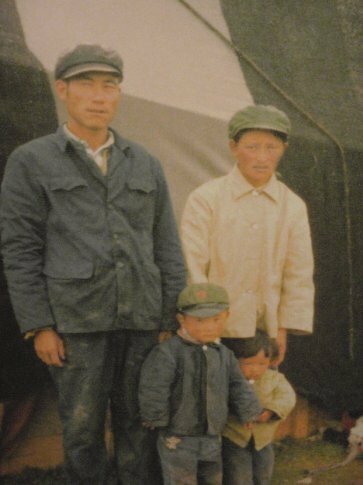 Since then the proportion of the Tibetan population has been increasing gradually and changing the general feel of the place as they increase in number. 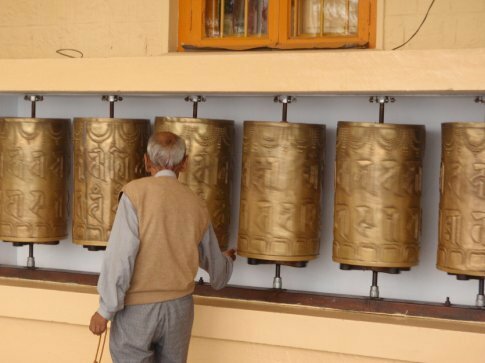 Obviously there is a visible racial difference but the behaviour of the Tibetans is quite distinct – many, especially the elderly, walk with prayer beads and prayer wheels. There's an air of politeness and respect that is just absent in India at large. People will wait and let you pass sometimes. 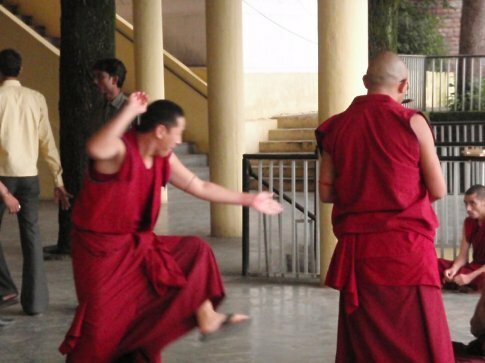 Monks in their deep red robes solemnly contemplate as they walk by. I was really starting to like this place and could understand when Footprint said that some people stay for weeks among the prayer flags and wheels. Although the Dalai Lama was not in town at the time I made the monastery he established, Namgyal, my first port of call. 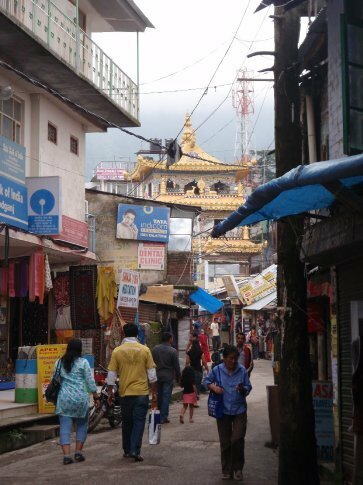 It's a pleasant walk down a narrow street lined with Tibetans selling handicrafts. After a quite strict security check I went into the temple area. Understandably it looked quite new in a sixties kind of way. 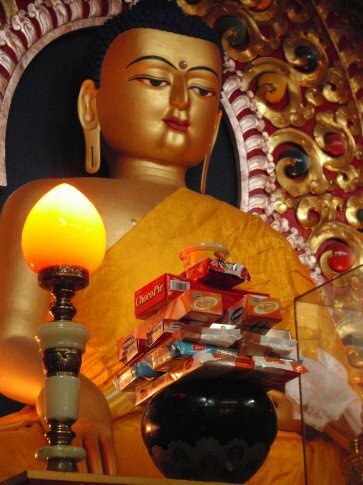 Offerings of biscuits were laid out in front of a Buddha image. 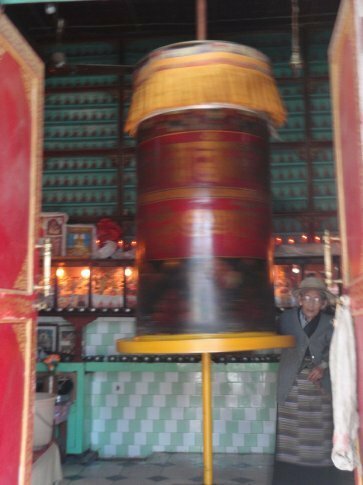 All around the temple, prayer wheels. Around a corner was another temple which didn't have any signs pointing to it but for me was one of the most amazing places I have ever been, Kalachakra Temple Unfortunately photography was not permitted so I can't share the images I still have in my head with you. The temple itself was simple enough, Buddha at one end, a little shrine to the Dalai Lama nearby. What impressed me so much were the mandalas painted, mural style around the altar. I have a rudimentary appreciation of art but have never found anything so intricately impressive as these mandalas. They depict, in the most amazing detail, the various deities of the Buddhist pantheon (I didn't even know there was a Buddhist pantheon!) along with messages of peace and various mantras. 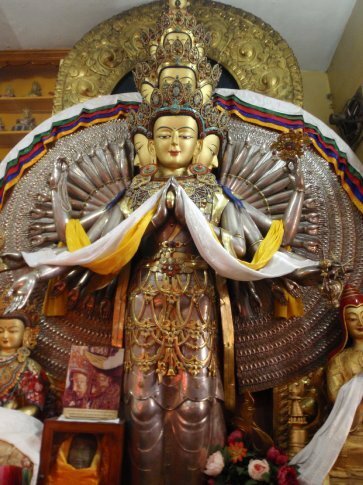 Equally impressive to me was the statue of two deities together, Kalachakra and Visvamata. The God (Goddess?) has two heads, each with many terrible, grimacing faces, all with three eyes. From the torso spread out a myriad, perhaps 200 hands, each holding an object of significance – a lotus flower, a sword, a mace. It took me about 10 minutes of staring at it to work out what I was looking at. Another statue, of many faced and headed Avalokiteshvana, the Boddhistva of compassion, completes the collection. 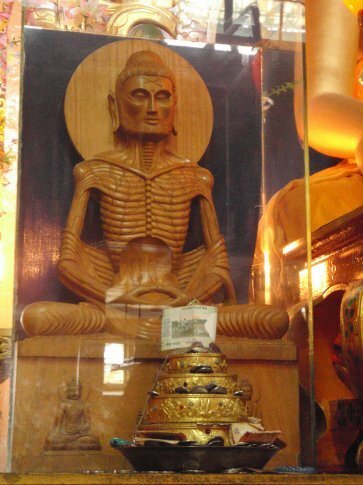 Tibetans believe the Dalai Lama is the incarnation of Avalokiteshvana. The calm atmosphere was punctuated by Indian tourists coming in and noisily taking photos only to be chased around by an elderly monk who looked like he would have preferred to have been assigned another duty. By the time I had finished my look around the temple I could hear a ruckus downstairs. It sounded like people fighting. Surely not here, of all places! On descending the stairs I discovered, to my surprise, tens of monks shouting, laughing and, to my great surprise, making ninja-style moves as if to make their points. 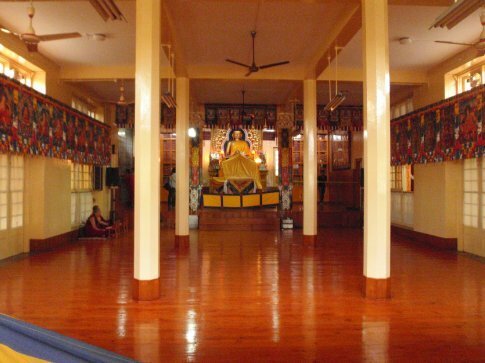 This is the School of Dialetics, also known as Little Lhasa, where monks come to debate. I'm not sure of the origin of the debating “moves”, or what were the topics but the flourish and clap at the end seems an effectivedebating technique. Plus they looked like they were enjoying themselves. Some had very stylised forms, others more subtle and functional. Nearby is the Tibetan Museum with some well displayed information on the Chinese invasion and the ensuing struggles. Tibet has been a distinct culture from China through the ages and the systematic destruction of that culture alongside the transplantation of millions of ethnic Chinese into Tibet to reduce the ethnic majority to a minority is disgusting. 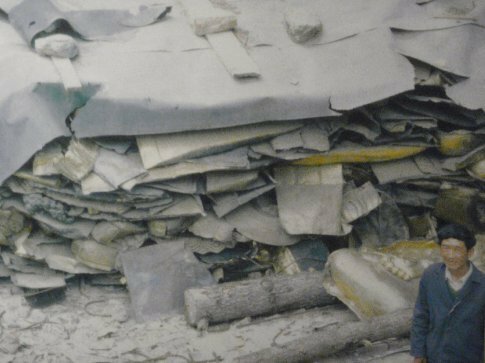 Some of the images were unsettling – for a Tibetan family made to dress Chairman Mao style or a Chinese construction worker grinning beside the remains of a recently destroyed temple. There was also an interesting documentary on the Dalai Lama's receipt of the Nobel Peace Prize in 1989. 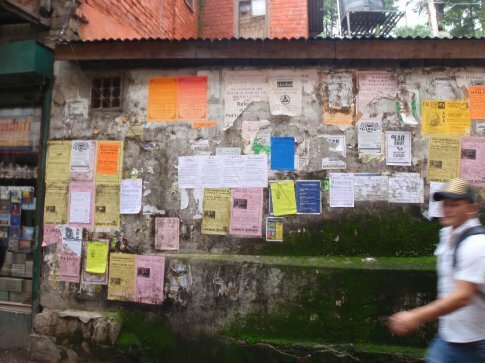 People advertise the various yoga/meditation/reiki/cooking classes and anything else which needs participants or volunteers in Macleod Ganj with the use of flyers stuck to a few walls around town. 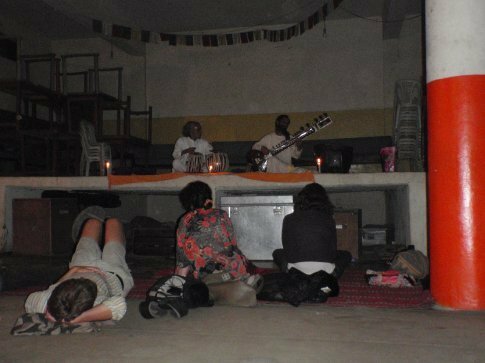 This was how I found out about LIT, Learning and Ideas for Tibet, a charity which raises awareness of the Tibetan plight, arranges language classes for former prisoners and also puts on movies and food of an evening. So I went to the Tibetan movie and pizza night. The Cry of the Snow Lion was the name of the movie. 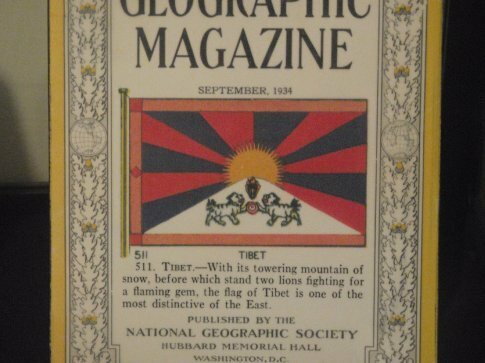 To set this in context, the Tibetan flag, although you won't find it in an atlas, consists of the famous Mount Kailash before which two mythical beasts, snow lions, fight for a flaming gem. 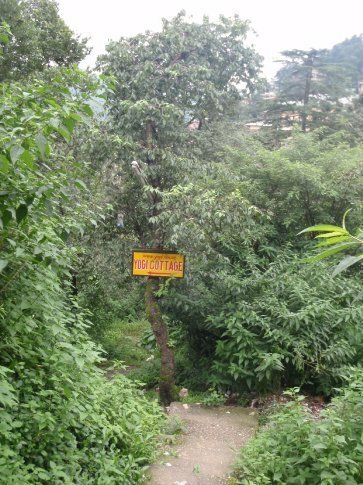 In the morning I wanted to stretch my legs so I made for Bhagsu, a little town a few km along the ridge. It was August 15th and I had completely forgotten (being in Tibetan frame of mind) that it was Indian independence day. 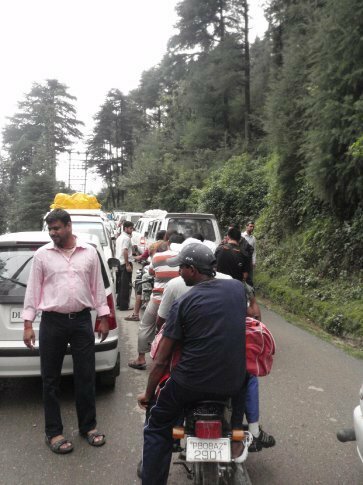 This meant of course that the Indians were out in force, and the obvious consequence ensued – a massive traffic jam blocking the way for trucks, taxis and rickshaws as well as pedestrians. Happy Independence Day and all that but is it soooo necessary to beep so much and never give way? It took about an hour to walk a kilomoetre, exchanging pleasantries (of frustration) with a monk on the way. 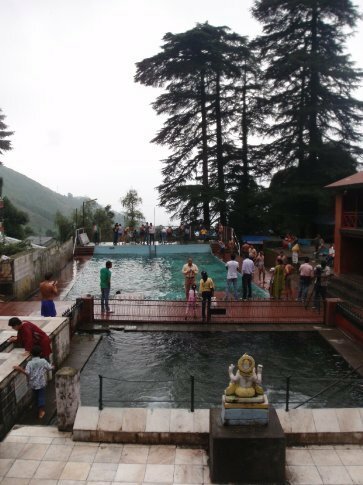 It's a strange little town, an Indian resort – big shabby hotels and an open air swimming pool beside the temple. The main attraction, though is the waterfall. I bumped into the monk again and we walked towards it together. 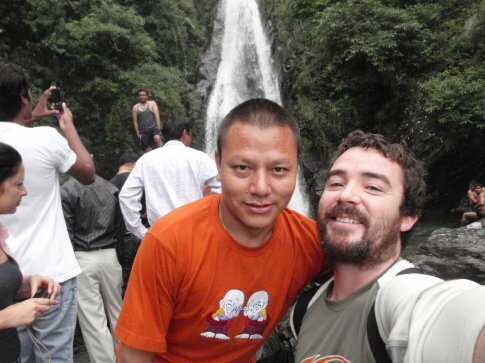 Tashi was his name and he had come to India a few years previously and had become a monk. He was only learning English though so I wasn't quite clear on the details. No matter though he was nice enough company and compared to the Indians who were whooping and cavorting in the waterfall he was like my BFF. On the way back into town Tashi asked me if I wanted to see his house. He had only arrived in Macleod Ganj three days previously (as had I) and he wanted to show someone his home (he was very proud and kept telling me how much new stuff he had bought for it). Why not I said and he showed me his abode, complete with TV and a nice little shrine made of sea shells surrounded by money. He offered me a coke and we chatted but were a little limited. The questions I was asking about being a monk, about Tibet, about his faith, were too hard for Tashi's English. He was content to discuss the things he wanted to buy (which I thought a little strange for a monk but hey). 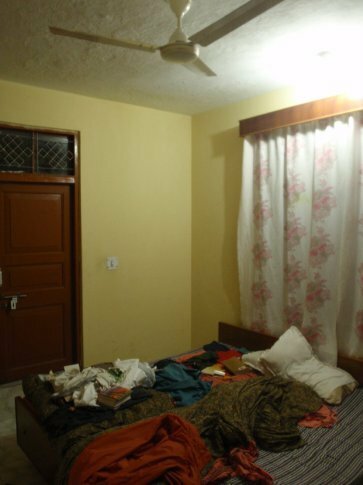 He asked me of I wanted to move in with him (after asking how much I was paying for my room) I declined, not really in the mood for living with a monk. My little hotel room was just fine. Eventually I made my excuses, but not before Tashi presented me with a small woven mandala, a little battered, and a book by the Dalai Lama. What a nice gesture. In an attempt to reciprocate I invited him to a Sitar concert I was going to in the evening. After this I went to my first yoga class since New Zealand. It was hatha yoga and a lot more relaxing to the bikram I was used to but enjoyable nonetheless despite my having great difficulty remembering the asanas. Tashi was dead on time and as a result we were too early for the concert when we got there so we went to the Tibetan beer bar for something to eat. Had I just invited a Tibetan Buddhist monk on a date? Now I had not eaten meat since I was in Mumbai, over a month earlier and was not about to start now. So I ordered a plate of vegetarian momos, Tibetan dumplings and a lemon soda. Tashi ordered a massive plate of chicken on the bone the majority of which he ate with his hands. I ordered some bread which Tashi comandeered. I attempted to engage him in conversation but it wasn't easy as he was stuffing his face most of the time. When he did talk it was mostly about the new consumer goods purchases he wished to make. My expectations of what a Tibetan monk should be (vegetarian, non-materialistic) were quickly being challenged. He told me about a mysterious Canadian man he had met a few years ago who gave him C$10 a month in two bi-annual chunks. I tried to understand why he didn't live at the monastery, like the other monks, or what the daily life of a monk actually was but the language barrier was too great. Before too long though it was time to get to the concert. It was in a hall with people sitting cross legged on the floor and a lady sang some beautiful (but very long) ghazals accompanied by the tabla first. 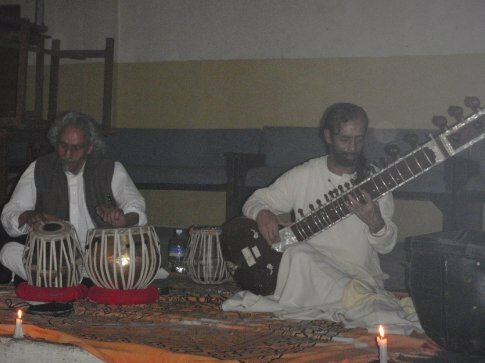 I think the tabla is an amazing instrument (two drums of different pitches played only with the hands).The frequent power cuts throughout the concert added greatly to the atmosphere. 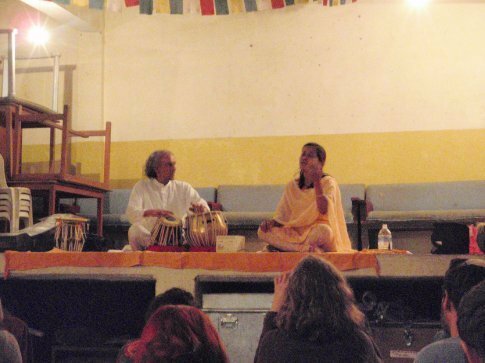 When the main event was ready to come on stage there was a pause – one of the tablas had broken and another had to be sourced before they could begin. I had been waiting for a long time to hear Sitar music live so I was really looking forward to it when the Jesus like figure started to play his fourteen stringed instrument. It was very pleasant music but his first song went on for about an hour. By this stage about half the crowd left (some didn't even wait for it to finish), presumably to recover some feeling in their arses. There were only about 10 people left at the end – a shame really as he played two encores and the concert ended a lot better than it had began. Tashi seemed to enjoy it too but admitted that his bum was sore also. As we walked back up the streets he seemed to not have any more conversation in him and I had run out of questions. I said goodbye without making arrangements to meet him again. It was all a bit strange to perpetuate. 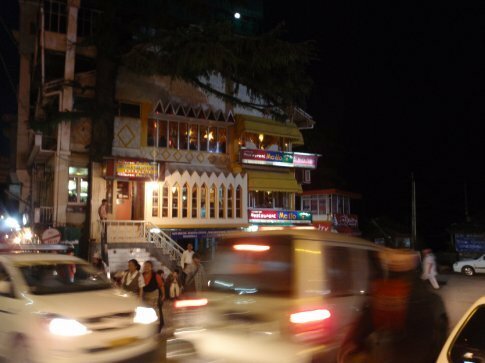 Macleod Ganj is certainly a place where you can lose track of time. Misty days drift into one another in a peaceful, unassuming manner. I kept going to my yoga class, somehow never managing to get up in time for the more dynamic vinyasa class in the morning, preferring hatha at 4pm. I did start to feel that the teacher didn't really correct his class though. I had time to think and walk and relax. Looking at the date one day I realised I had a month left to go before heading home. I started trying to arrange meetings in London for the week I am back. I went back to the monastery for another look at the mandalas and statues. I tried and failed to take photos of the mist rolling in over the streets. I went back to LIT for Tibetan movie and momos night – this time it was Seven years in Tibet, which was much better than I had remembered it. Perhaps I had better context this time round. I had made friends with a Danish girl, Marie, in the yoga class. One day we took a walk down in the rain to another monastery down on the side of the mountain. It was pretty but as if by magic the clouds lifted while were there. The sky and the view opened up – it felt like a new world – I could see for miles. There were mountains above us that I didn't even know existed! In the evening I chose a restaurant called Carpe Diem for dinner. It was a bit of a surprise to see Tashi sitting there with a plate of chicken bones and a full beer in front of him. When I had met him before he at least looked a bit like a a monk, with robes on. This time he was wearing jeans and a smart shirt. The enigma grew in my mind. He had been at English class and was practicing reading. As we were chatting someone I vaguely recognised sat down with a few peolple at the low table beside Tashi. “I'm sorry but is your name Emma”, I asked. “Yes...” came back the reply, very reasonably expecting some sort if explanation for my line of inquiry. I really had not thought about what to say next, so I went for the truth. “I used to have a crush on you when I was in primary school.” The whole restaurant went expectantly quiet, waiting for her response. I hadn't meant to embarrass her but it seems I had. She sat down and had a chat about school – she didn't remember me, but why should she, I think it was an 11 year old crush – one that you maintain from afar rather than act on. We did have, however, a pleasant conversation – she was spending a year in India volunteering and had been living all over the world. A group of Aussies who had been denied entry into the UK turned up soon afterwards and I stayed on with them swapping stories long after Tashi and Emma left. It was the third random small world encounter of the trip – Denise on a horse in Cusco, John in a street food place in Chiang Mai and Emma in Macleod Ganj. I also did a cooking class. It was on Tibetan momos. I had had some fabulous chocolate momos at LIT and was keen to develop the ability to make these little doughy pockets of happiness myself. 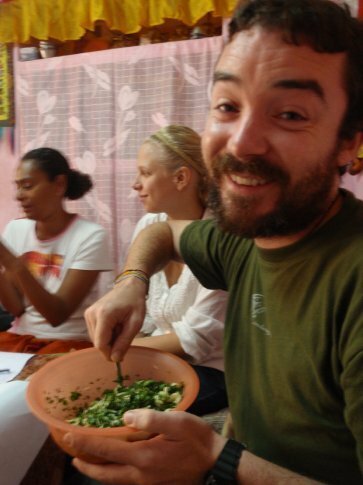 Lhamo, the teacher, was perfect – great fun, a little bit of a perfectionist and happy to answer all questions – related or not to cooking as they were. 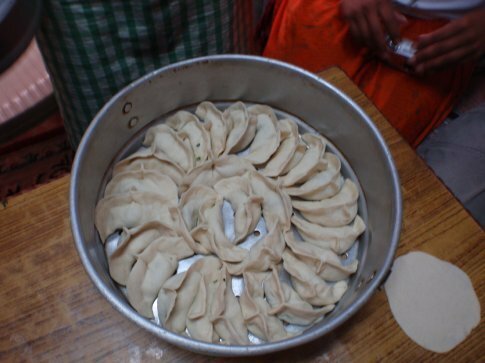 In fact we learnt the basics of momos – how to make the dough, three different fillings and the way to wrap and decorate the dough so you can tell which is which when you are serving. We made veg, spinach and cheese and sweet sesame seed but the same basics can be expanded to make them with meat and chocolate. The class was good fun and the momos were really good. I'll be making them when I get home for sure. After over a week in Macleod Ganj the time started to weigh a bit heavy – I would have to leave at some point or decide to just stay and knit woolly jumpers for a living. So I bought a ticket on the night bus to Shimla. 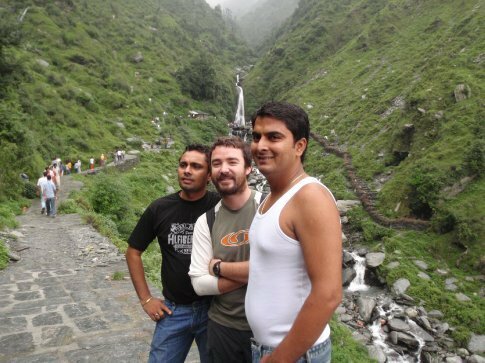 It really had felt like I was in Tibet rather than India – maybe that's why I liked it so much, or perhaps it was because most people I met were quite friendly. Or maybe just because I had actually met people. Whatever the reason, I was a bit sad to be leaving the first place in India I had truly become comfortable. Even the dpgs were more chilled out than usual. Of course, when we are in our comfort zone we stop learning, so time to move again. It sounds as if your friend Tashi is not a monk and was just wanting you to sponsor him, thus the talk about buying things. 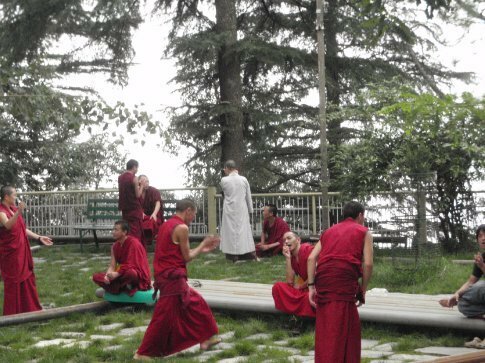 I do know a monk who will wear lay clothes, but *only* when he is away from McLeod Ganj, so I am very doubtful that your friend is a monk who sometimes decides not to wear robes and drinks alcohol (also against the rules)! It is interesting to see McLeod from a foreigner's perspective!